Unfortunately the greatest creative minds can’t live on forever but one of the refreshing things about the digital age is our new found ability to capture an essence of what a person was all about and share this with future generations. American Architect Gene Summers dubbed by many as Mies van der Rohe’s right hand man unfortunately passed away last year, but we can however take a moment to appreciate the work he undertook in his lifetime through this tribute piece that references all the key moments in his career. Gene worked as a architect, developer, teacher and artist in his lifetime and will be remembered by many for his work on the iconic Seagram building where he assisted two legends in their own rights, Philip Johnson and his own master Mies Van Der Rohe. Later on in his career through his own firm he would design the McCormick Place convention centre in Chicago which is still to this day the largest convention centre in the United States. Having worked on so many of Mies’ iconic builds in his sixteen years at his studio Gene is perhaps a rather underrated entity, he’s certainly someone I’ve developed a new found appreciation for today. 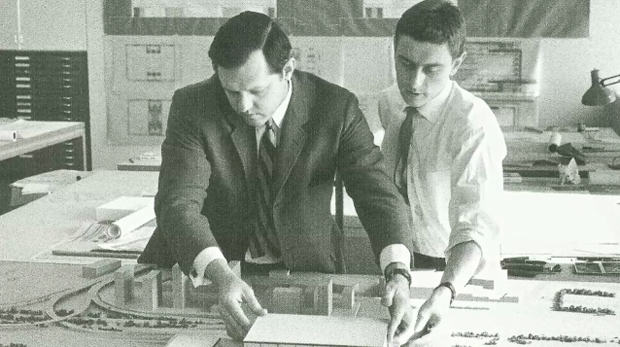 When his teacher passed away in 1969 he decided that alongside Phyllis Lambert they would start developing through their own company Ridgway Ltd. Gene felt it was a little risky to start a fresh given his success thus far with Mies however they took the chance and never looked back. Los Angles Biltmore hotel came up for sale so the pair purchased and developed the establishment into one of the city’s most sought after destination points with the help of artist Jim Dine’s work in each of the rooms. I loved the idea they had of using the colours of the rainbow throughout the hotel, this could of ended up a little garish but the duos eye for detail insured a clean and contemporary look remained. If you’ve got an interest in modernism I think you’re really going to cherish this piece, I certainly enjoyed seeing the path Gene Summers took throughout his career and I hope you do too. Watch below and enjoy!